Genealogy is so much more than family trees, records and dates. People’s lives are shaped by the events of their time. One such event is the Spanish Influenza Pandemic. The disease took on many names including “Spanish Influenza,” “Spanish Lady,” “La Grippe” or simply the “Grip.” While it affected virtually every family on earth there is little memory of it today. On August 12, 2018, I spoke at the National World War One Museum and Memorial on the centenary of the Spanish Influenza Pandemic and the U.S. Government response to it. The session was recorded for YouTube and can be found here. The speech was a culmination of several years of personal and professional research into the events surrounding the end of the First World War and the onslaught of influenza so prevalent that it killed between 50 and 100 million people. I first became interested in the flu when I learned that my own family was directly and dramatically affected by the pandemic. My grandfather Carl C. Siegel and his wife Mary came down with the flu and struggled to survive. Unfortunately, luck was against them and Mary Virginia DeHaven Siegel lost her battle on April 1, 1919. Carl was left with three young boys to raise on his own. Carl and Mary’s is not an unusual story; it is shared by many families. The flu hit worldwide in three large waves. The first, from March through July 1918, was the mildest wave with a low number or deaths, but unusual in that it lasted through the early summer. The second wave began in August 1918 peaking in October and November before dying out in early spring of 1919, while the final wave extended from April 1919 through June 1920. The outbreak is thought to have begun in Haskell County, Kansas where the first documented case was noted by a local doctor in early spring 1918. The illness soon spread as young men from the county were drafted and sent to Camp Funston (a training base on Fort Riley), Kansas. On March 11, 1918, an enlisted man reported to the camp hospital just before breakfast complaining of fever, sore throat and headache. By noon he was joined by more than 100 of his comrades. By week’s end the number of sick at the camp had ballooned to 500, forty-eight of whom died before the flu seemed to vanish. It re-appeared after our soldiers landed in Europe and progressed through the summer. There were very few American cases of flu in France, rather the flu began moving through Spain, France, Germany and the UK. China also reported flu cases. Because it declared itself neutral, Spain was not under wartime censorship and thought to have been the origin simply because the illness was openly reported in its newspapers. The flu gained the name “Spanish Influenza” but there is no evidence that it originated there. In fact, the Spanish called the disease the “French Flu,” while in France it was simply known as “La Grippe.” Others claimed that the disease started on the Middle Eastern battlefields, whereas others blamed it on China and India. Because of documented cases, scientists and historians now believe that it likely originated in Kansas and spread with the movement of soldiers from Camp Funston. The second wave of flu began in August gaining speed and intensity as it moved. One aspect of this disease I find particularly interesting is that not all locales were hit evenly nor did it roll across the United States in a solid motion. However, this second-wave of the epidemic spread quickly and violently. With a very few exceptions no American city was left untouched. Across the globe, flu ravaged cities, towns and rural areas, leaving many people too ill to work, fight the war, care for the sick or tend to the dead. Even as the Armistice was declared on November 11, 1918, fear rose that the devastating illness would never end and that the world would never recover. 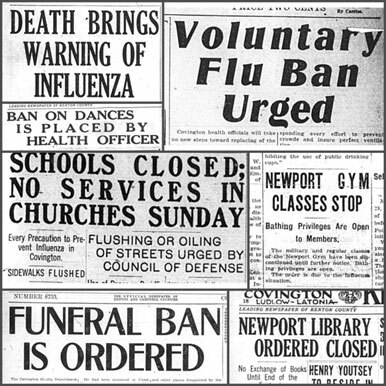 Finally, in the spring of 1919 the number of flu cases waned to only a few. The worst was over. Third wave from May 1919 through June 1920 was less deadly but no less devastating. Today scholars and experts believe that as many as one third of the global population contracted influenza between 1918 and 1920. While the gravest part was the ten week period between mid-September and early December 1918, many places were hit earlier and / or later. The number of Americans who died from influenza during this period is estimated at 675,000. Of those, almost 200,000 deaths were recorded in the month of October 1918 alone. 1 The disease was called “Spanish Influenza” due to the fact that Spain, a neutral country in WWI, did not have wartime censorship of the press. When news that Spanish King Alfonso XIII was sick with flu along with many Madrid residents reached the United Kingdom, The Times reported on June 3, 1918, that the flu epidemic began in Spain. While it was quickly determined that was not the case, the moniker was permanent.